I rarely use a body scrub unless I think of emptying a product 😛. I have always refrained from TBS brand due to high price, however as stated earlier, luck was by my side and I won an Instagram giveaway which had TBS products up for grabs. 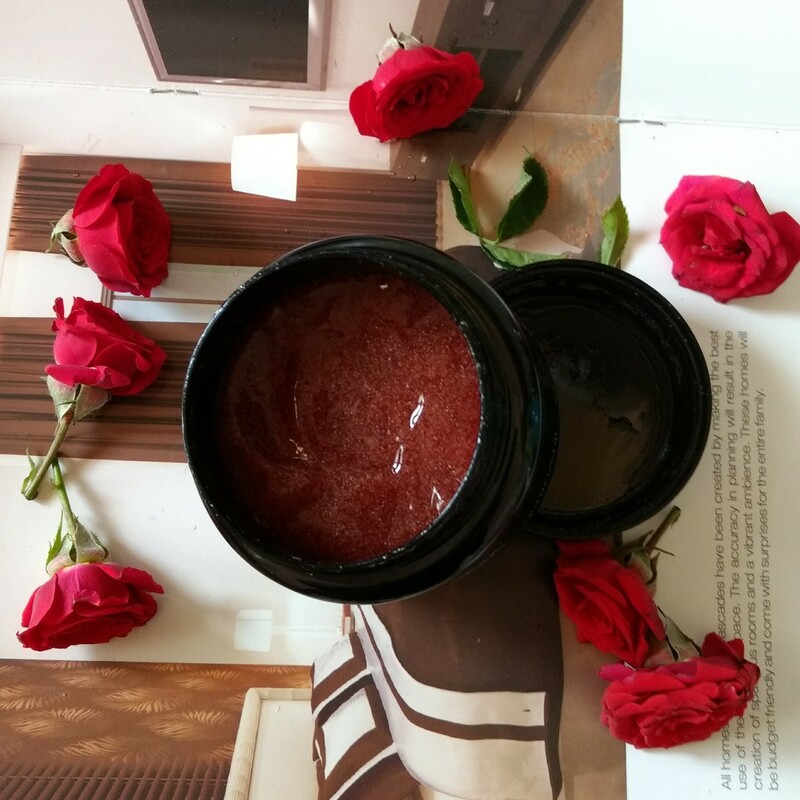 Today's review is about TBS British Rose Body Scrub, this is a long pending post and I thought of reviewing it 😐. The big, bulky tub packaging is black in colour with beautiful pink rose impression on top. The packaging is thick plastic and is not easily breakable. 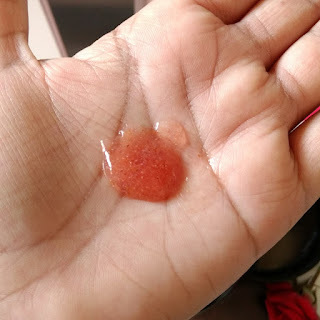 The scrub is baby pink coloured jelly with tiny scrub particles of rose. The inner bud part of rose have been used and I think plus some walnut particles also. 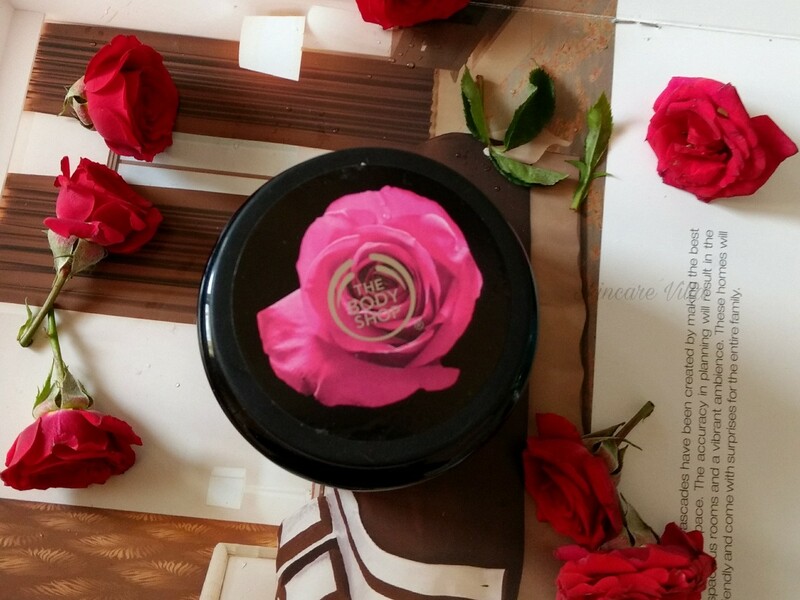 The scrub has a very mesmerizing rose fragrance and I am sure you will be addicted to it. The scrub very effectively brushes off dead skin cells and dirt. It easily spreads over the skin leaving it very soft and moisturized. I love using the scrub more as a face scrub than as a body scrub. The scrub has sufficient quantity of scrub particles not much nor less. Also the scrub particles size is very appropriate and aren't harsh. When used as a face scrub it effectively removes the white heads as well as dead skin cells. It makes the akin soft and even toned while leaving a hydrated look. I totally love this scrub and would highly recommend it as both body scrub as well as face scrub. Price, Shelf life and Availability - 1295 INR for 250 ml with a shelf life of 3 years. Available online as well as in TBS stores. I would recommend this scrub if you are TBS lover as well as love luxurious skincare junkie. Other than that I wouldn't say this is a must try or must buy. Do try if at on discount. Paraben tag, perfume tag is all mind, instead would love trying any homemade scrub.